Erdheim-Chester disease (ECD) is a rare form of non-Langerhans cell histiocytosis and manifests itself most commonly in skeletal structures; however, it can also involve other organs. Diagnosing ECD is challenging especially in the absence of bone complaints or pathological uptake on bone scintigraphy. Positron-emission tomography/computed tomography (PET/CT) currently plays a role in determining disease activity and extent, and to evaluate treatment response. 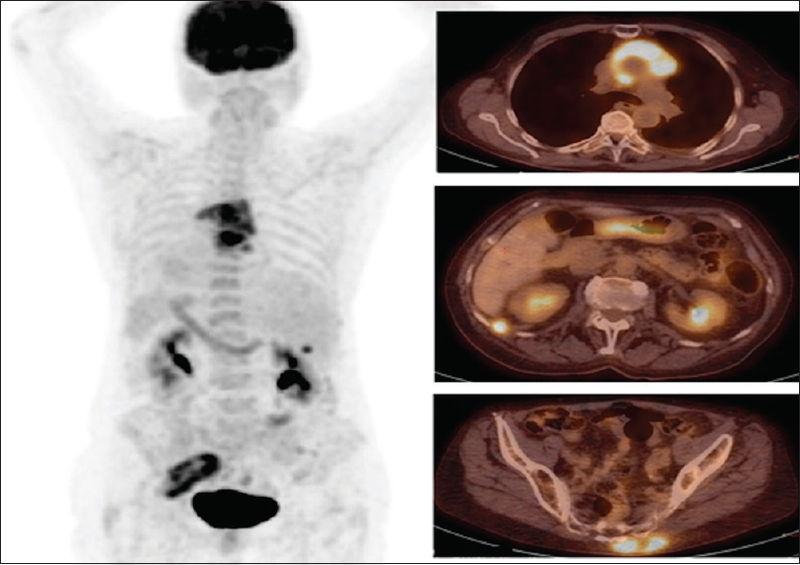 With this case, we highlight the additional utility of fluorine-18-fluorodeoxyglucose PET/CT (18 F-FDG PET/CT) to establish the diagnosis of ECD when bones are not involved. A 74-year-old female with a prior history of breast neoplasia and atrial fibrillation presented with dyspnea, chest pain, and pericardial effusion for which steroid treatment already was initiated. Blood testing showed a C-reactive protein (CRP) level of 120 mg/L. Antinuclear and rheumatoid factors were negative. Chest radiography showed a small bilateral pleural effusion. The pleuropericarditis was labeled as viral and steroids were continued. Two months later, cough and dyspnea reappeared, and CRP remained elevated (141 mg/L). She also presented a subcutaneous nodule on the left buttock that recently had become bigger and more painful.18 F-FDG PET/CT scan, to determine the inflammatory focus and evaluate the lungs and the subcutaneous sacral nodule, showed intense hypermetabolism at the ascending aorta, between the 11th and 12th rib and in the retrosacral region [Figure 1]. Repeated autoimmune tests, syphilis, Lyme borreliosis, bartonellosis, brucellosis, and Q-fever serological tests were all negative. Immunoglobulin G4 level was normal. Microbiological culture of the sacral abscess was sterile, and histopathology was noncontributive. Technetium-99 m methylene diphosphonate (99m Tc-MDP) bone scintigraphy did not show any pathologic uptake. A biopsy of the hypermetabolic intercostal nodule detected on PET/CT was performed. Histopathology revealed a xanthogranulomatous infiltration, CD68+ CD1a-S100, compatible with a non-Langerhans histiocytosis. No BRAF mutation could be withheld. Interferon (IFN)-alpha therapy was started after a negative BRAF-mutation retest, with rapid disappearance of symptoms and normalization of CRP-levels. ECD is a rare entity which occurs most commonly in middle-aged patients, equally distributed between the two sexes., The disease is characterized by xanthomatous or granulomatous tissue infiltration by non-Langerhans histiocytes. The immunohistologic characteristics are used to distinguish from Langerhans cell histiocytosis as follows: in ECD, histiocytes stain positive for CD68 and negative for CD1a, staining for S-100 is negative in 80%. Pathogenesis is poorly understood. Studies have shown histiocyte recruitment and accumulation in the tissues by cytokines and chemokines. The BRAFV600E mutation has been identified in approximately 50% of ECD cases. BRAF plays a role in the signaling pathway leading to enhanced cell proliferation and survival. Hence, there are both clonal proliferations associated with the BRAFV600E mutation and nonclonal tissue accumulation of histiocytes due to systemic proinflammatory cytokines and chemokines. Treatment should be initiated in all patients. IFN-alpha and pegylated IFN-alpha are the first-line choices for prolonged treatment, where the latter has lesser side effects. In ECD patients carrying the BRAF mutation, the use of BRAF inhibitors such as vemurafenib may be an alternative to IFN-alpha. Given the potential therapeutic implication of BRAFV600E mutations, retesting in case of a negative result is encouraged. Bone pain is the most common presenting symptom of ECD. Long bone uptake due to cortical osteosclerosis on99m Tc-MDP bone scintigraphy is a highly suggestive sign., Our patient, however, did not have bone pain and bone scintigraphy showed no pathological uptake. Cardiac involvement with ECD is seen in the majority of patients, leading to important morbidity and mortality. Most frequently, there is involvement of the circumferential periaortic sheathing and pericard, as seen in our patient. Pulmonary involvement of the lung parenchyma and/or pleura occurs in 25%–50% of patients. It can be asymptomatic or manifests as dyspnea and cough. Our patient's pleuropericarditis and periaortitis were probably a manifestation of ECD; however, this was not confirmed by histopathology. Cutaneous manifestation is relatively uncommon (around 20%). There is a broad clinical spectrum of cutaneous lesions, with xanthelasma-like lesions most frequently seen. Interestingly, ECD patients with xanthelasma-like lesions are more likely to have the BRAFV600E mutation. Our patient, however, had an atypical skin manifestation and was BRAFV600E negative. Diagnosing ECD is challenging due to its rarity and mimicry of other infiltrative processes. Diagnosis is based on histopathologic evaluation of involved tissue within the clinical context. Bone scintigraphy is useful to show skeletal involvement and to exclude other causes of bone pain, however, not all patients-like ours-have bone involvement.18 F-FDG PET/CT is frequently performed after the diagnosis to determine disease activity and extent. It had also proven useful to evaluate treatment response and to monitor disease activity. Moreover, PET/CT is valuable in the follow-up during treatment with BRAF inhibitors., A recent retrospective French study stated a superiority of bone scintigraphy in the initial evaluation, and a comparable performance of PET/CT with regard to conventional morphological examinations. However, our case illustrates the superiority of PET/CT to bone scintigraphy at baseline in establishing the diagnosis of ECD. Thus, even without classic bone symptoms or a negative bone scintigraphy, a possible diagnosis of ECD should be borne in mind. In conclusion, ECD is a rare, multisystem histiocytic disorder requiring a multidisciplinary approach in the diagnostic workup, treatment, and follow-up. Biopsy showing characteristic immunohistological features is essential to establish the diagnosis. Till now, PET/CT was typically used after diagnosis to determine disease activity and extent, and for treatment response evaluation. With this case, we suggest an additional role for18 F-FDG PET/CT in ECD, earlier on in the workup paradigm as follows: detecting a possible biopsy site and thereby guiding the diagnosis, especially in a clinical context without bone pain. Abdelfattah AM, Arnaout K, Tabbara IA. Erdheim-Chester disease: A comprehensive review. Anticancer Res 2014;34:3257-61. Cavalli G, Guglielmi B, Berti A, Campochiaro C, Sabbadini MG, Dagna L, et al. The multifaceted clinical presentations and manifestations of Erdheim-Chester disease: Comprehensive review of the literature and of 10 new cases. Ann Rheum Dis 2013;72:1691-5. Haroche J, Arnaud L, Cohen-Aubart F, Hervier B, Charlotte F, Emile JF, et al. Erdheim-Chester disease. Rheum Dis Clin North Am 2013;39:299-311. Dagna L, Girlanda S, Langheim S, Rizzo N, Bozzolo EP, Sabbadini MG, et al. Erdheim-Chester disease: Report on a case and new insights on its immunopathogenesis. Rheumatology (Oxford) 2010;49:1203-6. Haroche J, Charlotte F, Arnaud L, von Deimling A, Hélias-Rodzewicz Z, Hervier B, et al. High prevalence of BRAF V600E mutations in Erdheim-Chester disease but not in other non-langerhans cell histiocytoses. Blood 2012;120:2700-3. Chasset F, Barete S, Charlotte F, Cohen-Aubart F, Arnaud L, Le Pelletier F, et al. Cutaneous manifestations of Erdheim-Chester disease (ECD): Clinical, pathological, and molecular features in a monocentric series of 40 patients. J Am Acad Dermatol 2016;74:513-20. García-Gómez FJ, Acevedo-Báñez I, Martínez-Castillo R, Tirado-Hospital JL, Cuenca-Cuenca JI, Pachón-Garrudo VM, et al. The role of 18FDG, 18FDOPA PET/CT and 99mTc bone scintigraphy imaging in Erdheim-Chester disease. Eur J Radiol 2015;84:1586-92. Antunes C, Graça B, Donato P. Thoracic, abdominal and musculoskeletal involvement in Erdheim-Chester disease: CT, MR and PET imaging findings. Insights Imaging 2014;5:473-82. Adens A, Landy P, Terriou L, Baillet C, Beron A, Lambert M, et al. Usefulness of nuclear medicine in Erdheim-Chester disease: A Lille experience. Rev Med Interne 2017;38:235-42.